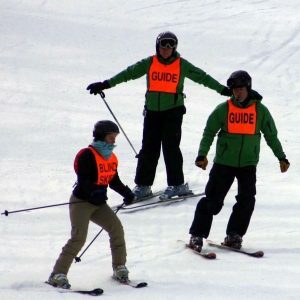 Killington, VT – More than 30 blind and visually impaired athletes from across the country will learn to ski or learn to race with Vermont Adaptive Ski and Sports this weekend at the 10th anniversary of the United States Association of Blind Athletes (USABA) Winter Ski Festival at Pico Mountain in Vermont. For 10 years, USABA and Vermont Adaptive have worked together to coordinate an event where Americans who are blind and visually impaired can participate in Alpine skiing, snowboarding and Nordic skiing. The event continues to be the largest annual gathering of skiers in the United States who are blind and visually impaired. Participants will ski at Pico Mountain on Saturday and Sunday with an option to practice Nordic skiing or snowshoeing on Sunday at Mountain Meadows Cross Country Ski Area. On Saturday, participants can practice with Vermont Adaptive’s auditory rifle system, the same system used for competition in Nordic Combined in the Paralympics. On Sunday, Nordic skiers can put their lesson into action while on skis. Vermont Adaptive’s team of instructors will work with attendees to learn to ski or improve skills. Many participants are returning and will have the same volunteer instructors as in past years. This year, more than 30 participants, including eight military veterans will attend. 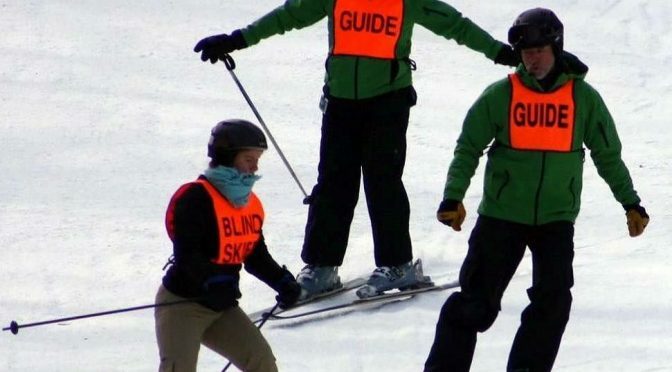 In some cases, participants will be attending this ski camp as their first time skiing without sight. More than 100 people will be in attendance for the weekend, including volunteer instructors, participants, family members, and friends. Fort Myers Beach, Fla. resident Nathaniel “Nate” Gorham is legally blind. Serving in the U.S. Army as 1LT, Military Police, since 2006, Gorham retired after doctors discovered he was suffering from progressive cone dystrophy, which leads to reduced visual acuity, central vision and photophobia. “I enjoy the challenge running provides me, and the feeling of accomplishment when my run is complete,” said Gorham. But he’s trying a new sport this month: skiing. In 2006, Army Sergeant Monaca Gilmore, of Rocky Mount, N.C., sustained injuries from the blast of an IED in Iraq. When she returned home, Gilmore underwent brain surgery to fix the fluid that was building in her brain. Unfortunately, her optic nerve had already been permanently damaged and the vision loss she now experienced was irreversible. Other participants hail from New York, North Carolina, New Hampshire, Mississippi, Ohio, Massachusetts, Florida, Maryland, Georgia, Virginia, Colorado, and various Vermont locations. In addition to skiing and winter activities, the festival includes a Friday night welcome party, a Saturday night banquet and dinner as a group on Sunday.